Metric: A Rock Band Declares Independence The new album Synthetica is the second to be released by the group's own distribution company, Metric Music International. "There's one band at the center of that whole organization — and it's us," says lead singer Emily Haines. Metric's new album, its second on the band's own label, is titled Synthetica. 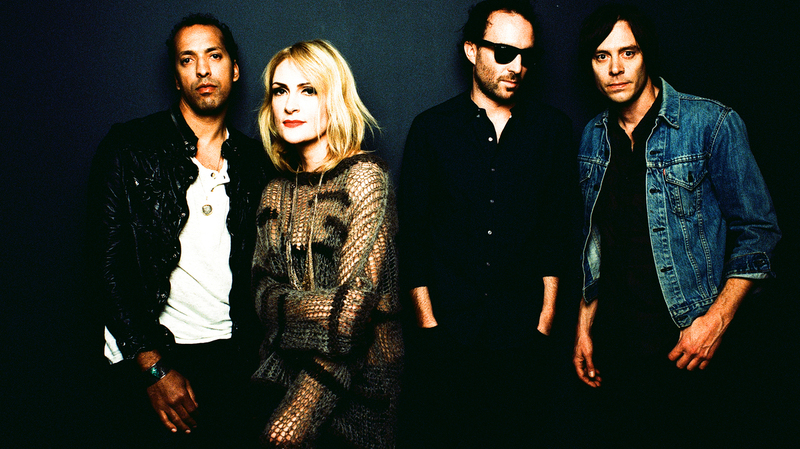 Left to right: Joshua Winstead, Emily Haines, James Shaw, Joules Scott-Key. Metric has long been identified as an indie-rock band, but it recently embraced the "indie" part of that descriptor in a big way. For their last album together, the band's members formed their own company — Metric Music International — to distribute the record, organize a tour and handle promotion without a label's support. The result was the biggest album of Metric's career: Fantasies sold half a million copies worldwide. "The only fundamental and life-changing difference is there's one band at the center of that whole organization — and it's us," singer Emily Haines tells NPR's Laura Sullivan. Metric has just released its second self-distributed album, Synthetica. Haines says the title is a term that wouldn't go away during the writing process. "When I was still working on Fantasies, I had kind of concocted this character, this sort of robot, soulless woman who I named 'Synthetica' — someone who was so free of flaws that she made being human seem repulsive," Haines says. "We started to develop other ideas of what the word meant to us: the idea of what's artificial versus what is real, and sort of imagining landscapes, even, of a place called 'Synthetica,' " she adds. "The word almost sounded like the music we wanted to make."